AgroPortal is an ontology portal/repository (with periodically updated versions) dedicated to the agronomic and plant domains. AgroPortal includes Knowledge Organisation Systems (KOS) about multiple aspect of agricultural data: technologies, breeding, food, plant phenotypes and traits, anatomy, etc. 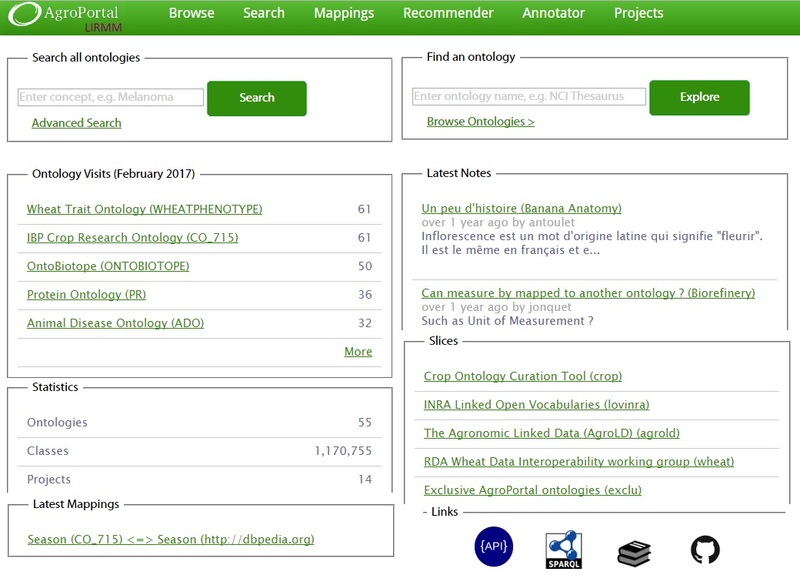 Those ontologies have been uploaded in collaboration with several driving use cases including: INRA Linked Open Vocabularies, Crop Ontology project, AgroLD project, RDA Wheat Data Interoperability Working Group, VEST/ AgroPortal Map of Standards and others. The VEST/AgroPortal unique map of standards (and its continuation on the VEST/AgroPortal platform at agrisemantics.org) is the result of collaboration of AgroPortal team with FAO within GODAN Action (note: AgroPortal was presented at the GODAN Summit 2016). AgroPortal reuses the NCBO BioPortal infrastructure and customizes it. All issues/notes about AgroPortal can be viewed on GitHub. For further information contact AgroPortal team. AgroPortal is indexed in BARTOC.org: Basel Register of Thesauri, Ontologies & Classifications.